Citation: Marinova R, Petrova G. EEG-derived indexes for monitoring the depth of anesthesia. J Pain Manage Ther. 2018;2(1):8-16. Performing general anesthesia for surgical interventions poses different problems to the anesthesia team. Along with the most important issue of patient safety, in recent years, with the development of medicine as a whole, the question of the quality of anesthesia is particularly relevant. The introduction of advanced surgical techniques and modern patient care requirements emposed new methods of anesthesia to be sought in the simplest, shortest and safer way possible. Various pharmacological agents are used for this purpose, combining them into a state of general anesthesia. The purpose of general anesthesia is not only analgesia and hypnosis but also suppression of somatic and vegetative response of the body. Monitoring the depth of anesthesia has always been a challenge for anesthesiologists. Initially, it was conducted by analyzing the relationship between nociceptive stimuli and the presence or absence of clinical signs such as loss of consciousness, movements of the hands and feet, cardiovascular, respiratory and vegetative manifestations (tachycardia, hypertension, sweating). These methods sustain evolution along with the emergence of new anesthetics, modern knowledge about the pharmacology of anesthetics and their effects on the EEG. 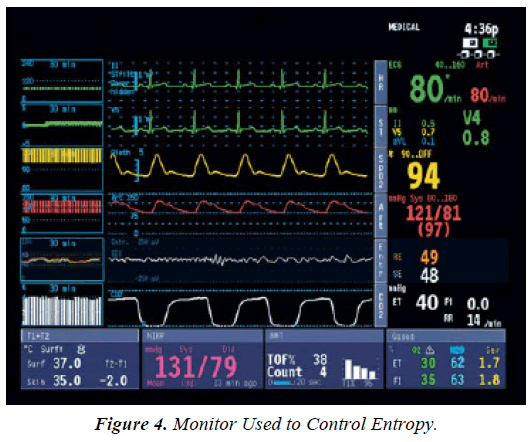 Since the early 1990’s, mathematical and statistical analyzes of the EEG have begun, making it possible to introduce different monitors in the clinical practice to determine the depth of anesthesia. Such monitoring is not an evolution, but rather a revolution in conducting anesthesia. Treat the patient, not the monitor The EEG in everyday clinical practice is also used as a method for detecting convulsive crises that do not have clinical manifestations. It is used in neuroreanimation in any suspicion of subclinic convulsive crises, especially in patients with cranial brain trauma who are sedented and relaxed. As a method of monitoring aneshthesia in intensive care units, the EEG is not applicable due to the complexity of the method and the lack of sensitivity and specificity. EEG analysis as monitoring of the depth of anesthesia evolved in several stages. According to a number of researchers, the spectral analysis of the EEG is the most popular and developed. The method decomposes the signal and its spectrum at separate frequencies using the Fourier analysis. It is possible to calculate several parameters, of which the spectral frequencies and the median frequencies are most important. Subsequently, the bispectral analysis of the EEG becomes applicable in anesthesiological practice. The Bispectral EEG Score (BIS) is a static index empirically derived from the EEG by a complex algorithm based on a study on a large number of patients. In general, it is a measure of the "coherence" of the EEG components, based on the principle that the more the EEG components are more synchronized, the deeper the anesthesia is [1,2]. Numerous studies have been published in the world literature on the significance and limitations in the implementation of BIS monitoring [3-7]. According to Glass et al. BIS is an easy-to-use monitor and is predictive of the depth of hypnosis in propofol anesthesia. According to Rampil et al. the BIS monitor has a number of limitations, the most important of which is the following: there is a huge dispersion of values among individual patients, i.e. no threshold value can be defined under which the lack of consciousness is assured. Other researchers [2,10] found that, like entropy, certain anesthetics that affect the limbic system (Ketamine, nitrous oxide) lead to loss of consciousness without affecting the BIS values. According to Meningaux et al. , the BIS signal also interferes with artifacts, such as pacemaker, intra-abdominal irrigation, and the warming systems type Bair Hugger. Myles et al. found that the reduction in BIS values did not completely exclude the presence of perioperative memoirs, and according to Katoh et al. , BIS monitoring does not exclude incisional movements. Monk et al. in their publication found that maintaining BIS values above 45 during anesthesia in adult injured patients increased post-operative survival. According to other researchers , such data should be interpreted with certain reservations, mostly for methodological reasons. There are publications that question the relationship between depth of anesthesia and postoperative cognitive dysfunctions . BIS correlates well with the level of alertness/ sedation and has a wonderful predictive value regarding the level of consciousness during anesthesia with Propofol, Isoflurane and Midazolam . After hypnotic administration, the BIS value progressively decreases below 100, with loss of consciousness being common at about 70-80. BIS between 40 and 60 reflects an adequate hypnotic effect during general anesthesia and expected rapid recovery of consciousness. BIS <40 is an expression of deep hypnosis. A number of studies [5,17] found that the BIS value was indicative of the haemodynamic response to intubation, to skin incision, and verbal commands during both inhalation and intravenous anesthesia. The BIS monitor can serve as a reference for anesthetic dosing, providing better hemodynamic stability and quicker exit from anesthesia . BIS monitoring is also associated with a lower cost of anesthesia because it reduces anesthetic consumption and shortens the stay in postoperative active surveillance structures, and is also an important corrective for titration of anesthetics in cardiology, pediatric and geriatric surgery [19,20]. The BIS monitor also has a number of limitations: it is an indicator of cortical function but does not reflect the activity of the subcortical structures (including the spinal cord) that mediate the response to unpleasant and painful stimuli, i.e. the BIS monitor is not a reliable indicator for the absence of pain. In the presence of dementia senilis, for example, BIS is also not an adequate indicator. According to some studies, BISvalues increased with anesthesia with Nitrous gas and Ketamine [10,21]. Injection of Esmolol can also reduce BIS values during vigorous stimulation such as endotracheal intubation . Mathew et al. found that in patients undergoing cardiopulmonary bypass with constant Fentanyl and Midazolam, hypothermia lowered the BIS index by 1.12 at each 1°C lower. The BIS index is not a reliable indicator and when the patient is anaesthetized with high doses of opioids . In such cases, the use of hypnotics is reduced, so their effect on the EEG is lesser. The BIS monitor is a more reliable indicator of anesthesia with low to moderate doses of an opioid analgesic and hypnotic titrated according to BIS values. The monitoring to control the depth of anesthesia in everyday clinical practice is recommended mainly after 2006 . The concept is that BIS monitoring serves to titrate anesthesia in order to avoid both memory and overdosage. VEPs are recorded from the occipital cortex in response to light stimulation. They are used for functional monitoring during neurosurgical interventions, in case of lesions of the optic nerve, the chiasm, and the pituitary. AEPs are the most commonly used in practice to measure the depth of anesthesia. They can be divided into three parts according to their time and place of origin, as shown in Figure 1. Figure 1: Auditory Evoked Potentials (AEP) (AER=auditory evoked response). √ Brainstem responses are presented with numbers from 1 to 6 and last 0-10 ms after stumulus. They reflect the process of signaling in the brainstem. √ Middle cortical response or medium-latent AEP (15-80ms after the stimulus) are marked by waves N0, P0, Na, Pa and Nb. It is considered that they originate from Nucleus geniculatus medialis and primary auditory cortex. √ Late cortical response or long-latentAEP (80-100 ms after stimulus), consist of waves P1, N1, Pa and Nb and reflect the neuronal activity of the frontal cortex and its associated areas. With the increase in tele-expiratory concentrations of inhaled anesthetics, the decrease in the amplitudes of AEP, SSEP and VEP increases, a dose-dependent reduction of the AEP and VEP amplitude is observed but without effect on the latency period. Opioids at normal doses result in minimal changes in the EP. Thomton et al. study the specific changes of the AEP components during anesthesia and waking. Powerful inhaled anesthetics increase AEP latency from brain stem - waves III and V. These anesthetics increase latency and reduce the amplitude of early cortical AEP. Intravenous barbiturates also increase components III and V of the brainstem, while other intravenous anesthetics such as Propofol, Etomidate, Altezin do not alter the response of the brainstem but alter cortical latency and amplitude in a similar way . The use of evoked potentials to monitor the depth of anesthesia is associated with certain technical, clinical and practical problems. A number of artifacts may reduce EP: the characteristics of the stimulus (intensity, duration, interval between stimuli); electrode position, applied anesthetic technique, gender and age of the patient, choice of certain anesthetics . Mid-latent auditory evoked potential (MLAEP): Thomton et al. investigate the use of MLAEP to detect the presence of wakefulness during anesthesia, focusing on the latency and amplitude of the Ra and Nb waves. Consequently, several studies state that MLAEPs are a reliable indicator of depth of anesthesia [27-29]. It has been shown that MLAEPs are significantly influenced by the use of hypnotics in a gradual, reversible and non-specific way. Hypnotics reduce the amplitude and increase the latency of the Ra and Nb waves. A number of studies have established a high level of sensitivity and specificity for MLAEPs, similar to BIS (85,189). MLAEPs have some inconveniences that limit their clinical use. These are: significant response time (0.5-5 minutes), complicated adjustment, lack of single parameter, calibrated to the state of anesthesia. 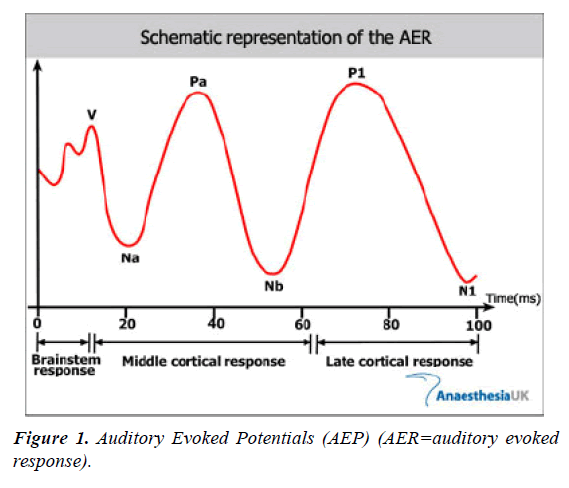 Auditory evoked potential index (AEPI): It is derived from the AEP and represents a single numerical value corresponding to the depth of anesthesia . AEPI reflects the AEP morphology and is calculated from the amplitude difference between consecutive segments of the curve. AEPI occurs every three seconds. According to Doi et al. , AEPI of value 37 is 100% specific and 52% sensitive to lack of consciousness, and best corresponds to BIS values to distinguish waking from anesthesia status. AEPI reports the response from the subcortical pathways, which partially reflects the activity of the subcortical structures, including the spinal cord. Consequently, it can be concluded that AEPI would better anticipate response to pain stimuli compared to BIS. Gajraj et al. compared AEPI, spectral edge frequency, MF (median frequency) and BIS during a target-controlled infusion of propofol. They find that out of the four indicators, AEPI has the best sensitivity in terms of distinguishing the transition from conscious to unconscious. A-Line autoregressive index (AAI): Jensen et al. developed a new adapted method for extracting MLAEP from the EEG signal, which is an autoregressive model with an external input allowing extraction of the AEP signal of 15-25 extracts of 110 ms. A monitor has been created that calculates the AAI index. Its BIS-like values are from 100 (wakeful) to 0 (deep hypnosis). Struys et al. compared AAI with BIS in patients who received a target-controlled infusion of Propofol, concluding that both indices are adequate indicators of sedation and loss of consciousness. Both methods, however, cannot predict the pain stimulus response. Schmidt et al. in their study conclude that BIS and AAI are better than hemodynamic parameters and classical single EEG parameters, such as MLAEP, in terms of unconsciously distinguishing between consciousness and transition from wakefulness to anesthesia. Auditory evoked potentials represent a physiological measurement of the response of subcortical and cortical structures to a particular auditory impulse. Such a response can be divided into three consecutive series of positive and negative waves: an early response that reflects brain stem activity, a moderate latent response, an expression of early cortical activity and a late cortical response. Indicative of the depth of anesthesia are only the middle-labeled responses. The wavelength period and amplitude Nb and Pa are the two main parameters of the analysis (as mentioned above). According to Iselin-Chaves et al. , mid-latent AEP are less predictive than BIS in terms of loss of consciousness during anasthesis with Propofol. In publications it is quoted that, like the BIS, the predictive value of the AEP as a witness to the pain stimulus reaction is indisputable (85, 130). New studies cite that indicators such as the AAI index (calculated from the mid- latent AEp) have good predictive activity on loss of consciousness. The AAI for the moment is in a clinical study period. The word “entropy” was first proposed as a thermodynamic principle by Clausius (1867). It describes the distribution probability of molecules of gaseous or fluid systems. Claude Shannon  developed the concept of "information" or "logical" entropy as part of the information theory in the 1940s Shannon CE . Shannon's entropy is defined by the equation: H = -Σ Δpk log pk , where pk is the probability that an event is a condition k.
Entropy is a measure for distribution of an event. Data with a wide but unlikely spread will have high entropy. On the contrast: data with narrow, peak distribution have low entropy. So far, numerous entropy algorithms have been proposed and used to quantify DoA, covering Spectral entropy [which includes Response Entropy (RE) and State entropy (SE)] Viertiö-Oja et al. ; Klockars et al., Approximate entropy (ApEn) Bruhn et al. , Sample entropy (SampEn) Richman and Moorman , Fuzzy entropy (FuzzyEn) Chen et al. , Shannon Permutation entropy (SPE) Li et al., Shannon Wavelet entropy (SWE) Särkelä et al. , and Hilbert-Huang spectral entropy (HHSE) Li et al. .
Spectral Entropy is the method applied in the commercial M-Entropy Module Viertiö-Oja et al. . It consists of two parameters: Response Entropy (RE) and State Entropy (SE). SE primarily includes the spectrum of the EEG signal from 0.8 to 32 Hz, and RE includes electromyogram activity from 0.8 to 47 Hz Viertiö-Oja et al. . Shannon Wavelet entropy (SWE) is the Shannon entropy in the wavelet domain, which indicates signal variation at each frequency scale Rosso et al. . And the Hilbert–Huang spectral entropy (HHSE) is the Shannon entropy based on the Hilbert–Huang transform proposed by Huang et al. . HHSE has been successfully applied to the anesthetic EEG signals Li et al. . The above methods are based on the frequency spectrum. Whereas many entropy methods are based on the time series and phase space analysis. ApEn is an algorithm derived from the Kolmogorov-Sinai entropy (Pincus, 1991). It quantifies the predictability of subsequent amplitude values of a signal. A previous investigation showed that ApEn correlates well with the concentration of desflurane Bruhn et al. . However, ApEn lacks relative consistency and is highly dependent on data length, SampEn was proposed to overcome ApEn's limitation by removing self-matching and relieving its bias (Richman and Moorman . SampEn has been used for analyzing EEG signals Montirosso et al. ; Yoo et al. . FuzzyEn was proposed by Chen et al. . It is based on the fuzzy membership functions to define the vectors' similarity, using the soft and continuous boundaries of fuzzy functions to ensure the continuity and the validity of FuzzyEn's definition Chen et al. . SPE was introduced by Bandt and Pompe . It is a complexity measure based on symbolic dynamics Bandt and Pompe . Because of its simple concept and fast computation, SPE has been widely used in EEG signal analysis Cao et al. ; Li et al. [41,52]. Furthermore, its derivatives, multi-scale permutation entropy Li et al. and composite permutation entropy index Olofsen et al. have been successfully applied to analyze EEG signals during anesthesia. However, “No one knows what entropy really is, so in a debate you will always have the advantage.” This statement is true for EEG analysis today Ferenets et al. . Each entropy index has its own advantages and disadvantages, but how does their performance compare when evaluating the effect of anesthesia on brain activity? To this end, some researchers have compared the performance of different entropy methods for anesthesia monitoring Sleigh et al. [56,57]; Bein . Unfortunately, these articles analyzed no more than three entropies. To our knowledge, a systematic comparison of the performance of them in assessing anesthesia drug effect is lacking. With regard to the EEG, entropy is another way to statistically describe the variations of the EEG signal. Most researchers in their studies pose the question, "Is this method comparable to the rest in terms of switching to lower frequencies of the EEG during anesthesia and anesthesia?" Neurophysiologically, entropy has been shown to be an indicator of cortical function, since when the cerebral cortex goes unconscious, an intrinsic neuronal decline in the logarithm of the number of micro-states is observed. It is believed that "entropy" reflects not only the EEG activity, but in fact also gives information about the intracortic flow. Entropy is a logarithm of the number of ways in which micro-states can regroup and preserve the same macro-state. The difference between true thermodynamic entropy and other information entropy is in the evaluating the kinetic energy from the distribution of individual molecules. Given that the brain cortex flow is associated with redistribution and transfer of electrical signals, EEG entropy measures the activity of the pyramidal cells. Figure 2 presents the concept of the patient's state of low and high entropy. Figure 2: Concept of entropy. EEG allows to some extent visualization of the cortical process, therefore changes in EEG-entropy measure the changes in the cerebral cortex. The main cortical function is the creation and processing of information, so it would be very useful to measure this information somehow. It is problematic that the word "information", similar to the word "disorder", has several meanings and nuances, depending on the context. The simplest and most practical definition of EEG-entropy would be "measuring the extent to which suppressive factors (e.g., general anesthesia) reduce the number of susceptible (accessible) conditions present in the cortex." Consequently, it can be assumed that the greater number of micro-states is associated with a more complex system, but entropy itself is not a measure of the complexity of the system, which is also influenced by other factors, as well as responses to incoming signals 46). ЕМG, RE- and SE-entropy: The Surface Electromyogram (EMG) is an algebraic sum of the electrical activity of a muscle fiber population. There is a direct link between the amplitude of EMG and the muscle tension during an isometric contraction. In an anesthetized conscious patient, the high tonic activity observed in the EMG is proportional to the level of stimulation, alertness or psychological stress. Increased EMG-phase activity is associated with periods of physiological stress, for example, in the sense of pain. For unconscious patients, EMG measurement should be done by frontal muscles that are of a relatively fixed length which reduces the potential impact of fiber variations (isotonic contraction). These muscles are also preferred because of their inervation from special efferent fibers of the facial nerve. It is important to note that the embryonic origin of the frontal muscles is from the brachial arches, which are visceral formations. EMF from frontal muscles is a simple and non-invasive method for measuring autonomic tone. Voluntary and involuntary frontal muscle contractions respond to different innervation pathways and reflect a different degree of wakefulness or neuromuscular blockade . These dependencies are presented in Figure 3. Figure 3: Typical power spectrum of a biopotential signal captured on the frontal region. The EEG signal predominates in the frequencies up to approx. 30 Hz, while EMG predominates in higher frequencies ranges. Vertical scale is logarithmic. The suppressed consciousness during general anesthesia results in a dramatic decline in the tonic activity of the frontal muscles. Some researchers have indicated that increased phase activity, following medications that suppress EMG-amplitude, is an indication of inadequate anesthesia. In addition, they indicate that the phase activity that measures EMG is also observed with neuromuscular relaxants . According to most researchers, there are three different types of stimulation-emotion, sounds and ischemia in clinical practice, and they can cause an increase in the amplitude of the EMG phase during states with a low level of consciousness. EMG monitoring may be helpful in titration of opioids: facial muscles are not only volitional, but are also innervated by structures in the brain stem associated with emotions and stress. Therefore, minor changes in EMG may be due to inadequate analgesia and the EMG responds faster to changes than BIS . Kern et al. , in their study indicate that EMG has a good correlation with response to painful stimuli in healthy volunteers. Shander et al. also found that EMG may be predictive of the need for analgesia and provide better intraoperative analgesia. Lennon et al. indicate that moderate levels of muscle blockade can be achieved without affecting electromyographic monitoring of the facial nerve. According to Edmonds Jr et al. changes in EMG, in response to stress (pain), reflect the function of the brainstem that is independent of the level of consciousness (cortex). Dutton et al. showed in their study that the electromiographic response can be used to determine the depth of anesthesia. According to them, the biopotential measured in the frontal area includes a significant electromiographic component of muscle activity. The electromiographic signal has a wide spectrum, similar to noise, and during anesthesia, frequencies above 30 Hz usually dominate. The EEG signal is at lower frequencies (up to about 30 Hz). At higher frequencies, the EEG signal exponentially decreases. A sudden change in the EMG and EEG signals most often signals that the patient is subjected to external stimulation such as pain or surgical irritation. Such an answer is usually the result of inadequate anesthesia. If stimulation continues and an analgesic is administered, it is very likely that hypnosis is too superficial. Because of the higher frequencies of the EMG signal, the change reporting time is shorter than the low-frequency EEG signal. The authors believe that EMG monitoring responds more quickly to changes in patients' clinical status. According to Edmonds et al. changes in EMG, in response to stress (pain), reflect the function of the brainstem that is independent of the level of consciousness (cortex). For clarity, two entropy parameters are introduced: one in the EEG frequency range, the second across the entire frequency range including EEG and EMG frequencies. 1. State entropy (SE entropy) is calculated in the spectrum of frequencies from 0.8 to 32Hz. SE measures the EEG spectrum of the spectrum and mainly reflects the patient's cortical activity. 2. Response entropy (RE-entropy) is calculated in the frequency range from 0.8 to 47Hz. RE includes both EEG - the dominant and EMG- dominant parts of the spectrum. RE- and SE- entropy have different informative value for anesthetists. SE entropy gives an idea of the level of activity of the cortex, at any time of anesthesia, and only with a numerical reading. The time windows are selected so that transient fluctuations are removed from the read data. RE-entropy, on the other hand, quickly reacts to changes. Different functions of the two parameters typically occur when the patient wakes up when an increase in RE-entropy is first observed in parallel with muscle activity, followed by an increase in SE entropy a few seconds later. RE- and SE-entropy are parameters that are reported to the anesthesia monitor along with many other data. To make the entropy parameters more clear and to optimize data usage, some modifications have been made. A two-digit number displayed on the monitor is easier to read than a decimal or three digit. 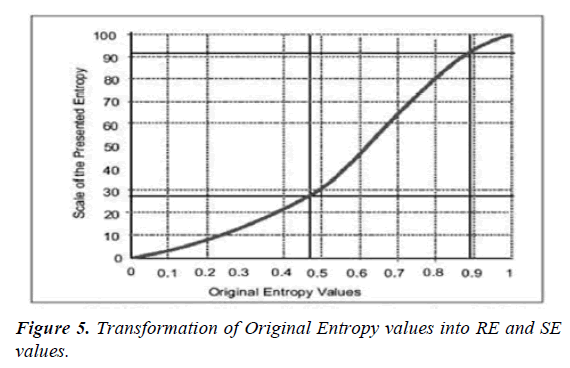 Therefore, the orginal values of entropy 0 to 1 have been converted by non-linear transformation into an integral scale from 0 to 100 (Figure 4). Figure 4: Monitor Used to Control Entropy. RE-entropy ranges from 0 to 100 and SE entropy from 0 to 91. Maximum values correspond to waking. With anesthesia worsening, entropy values progressively decrease. Transformation of the original values of entropy into RE- and SE-entropy is presented in Figure 5. Figure 5: Transformation of Original Entropy values into RE and SE values. • Electrocautery - the entropy module is highly tolerant to electrocautery. • Eye movement, flashing, other movements - the artifacts are technically ignored in two stages. SE entropy is related to the level of unconscious state (cortical activity), the lower the value of SE entropy, the deeper the unconscious state is. Similarly, the lower the subcortical activity (EMG activity), the lower the value of RE-entropy. Figure 6 shows the electrode locations of the entropy module. 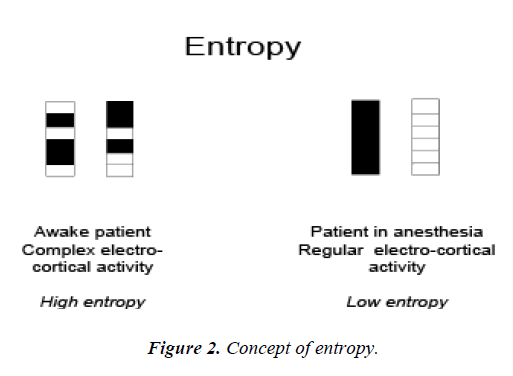 As noted above, entropy, as a method of monitoring the depth of anesthesia, besides EEG activity, also measures the activity of the frontal muscles. The latter is indicative of the adequacy of the subcortical component of anesthesia. It is measured as a difference between SE- and RE-entropy. Follow-up of the cortical and subcortical component of anesthesia through the entropy method can provide more adequate anesthesia and greater safety for patients and anesthetists . In childhood, the EEG changes along with the maturity of the brain. The frequency of background in awake EEG activity increases with age. This fact can be related to the use of EEGbased monitors, such as BIS, which mainly involves analysis of the power spectrum ratio in its algorithm. The entropy module is based on different EEG-derived indeces, making it more independent of age-related changes in the EEG. Davidson et al. describe that after waking from Isofluranean-Nitrous gas anesthesia, entropy values are higher in contrast to values during anesthesia for all age groups. Entropy indices have higher values than those during anesthesia in children from 1 to 12 years of age. Similar dependence is not seen in babies under 1 year of age. There is a correlation between BIS and entropy in infancy, but not under 1 year. Few studies have examined the use of BIS and entropy in childhood. Most authors recommend them only to children over the age of 1. The results published so far are only available during anesthesia with Sevoflurane and Isoflurane. Further research is needed with regard to other anesthetics. Few studies have been published on entropy as a method of monitoring aneshtesia in ICU. For the first time, Walsh et al. attempted to clarify the role of monitoring entropy to establish the sedative level in ICU. In the prospective study, 30 patients on mechanical ventilation, sedated with Propofol or Midazolam (i.v. perfusion) were enrolled. Entropy index values are monitored for up to 72 hours. The level of consciousness is reported every 30 minutes on the modified Ramsay scale (standardizes stimuli, including tetanic stimulation at a deep level of hypnosis). Mean values of RE- and SE- entropy decreased at higher Ramsay scale values, but with large variations, especially at values 4-6 on Ramsay. Distinguishing superficial versus deeper aneshtesia is not entirely adequate. There is often an on-off effect: entropy values are rapidly changing from low to high and vice versa. The onoff effect applies to both entropy indices: RE- and SE-entropy, and it is also associated with frontal EMG activity. High values of entropy during deep aneshthesia are closely related to high relative frequencies of the frontal EMG. Based on this pilot study on entropy, as a sedative monitor, it can be noted that entropy monitoring is not a reliable measure of the sedative level in patients in the ICU. High values of entropy during deep aneshthesia are associated with a relatively high frontal EMG activity. A similar problem is also found in most BIS monitor studies: EMG activity detected by the monitor vitiated the interpretation of aneshthesia level results. In the Haenggi et al. study, BIS and entropy distinguish the stages of very deep, deep to moderate and lack of aneshthesia with a comparable probability coefficient. Interand intraindividual differences are significant for both indices. The authors conclude that determining aneshthesia by BIS and entropy excludes the definition of a target range of values in patients undergoing intensive care treatment. According to Kaskinoro et al. , because of the immense differences between individual values in BIS and entropy, the question is whether these indicators are a reliable indicator. In this study, RE-entropy was used as a marker for the analgesia titration with Remifentanil, which, as noted on several occasions, also includes the activity of the frontal muscle. REentropy, however, has not yet been validated as an index of pain, nociception or sensitivity. It has been shown that much more complex neurological changes and responses, including cortical circulatory activation, are present in patients in a vegetative state, i. e. do not indicate wakefulness . Certainly, the possibility of a window to brain activity during general anesthesia makes sense. 171 years after the first public demonstration of anesthesia with ether, we still rely on the patient to tell us if our affections have the desired effect on the CNS (for example, "can you open your eyes? "), then we have the option to answer or no, ie. "on-off" type information. The brain, however, works with more nuances, and in the up-coming years we are bound to expand our horizons. In his study Lui  suggests that the EEG is a "brain window" only when conditions are strictly controlled and expectations are not too optimistic. So, if we want the electroencephalogram to reflect the depth of anesthesia, not awakefulness, it is in a state of little or no human intervention, along with a well programmed infusion pump, to do a great job of delivering the required concentration of anesthetic for achieving desired level of anesthesia or aneshthesia [72,73] The application of such technique is very tempting for endoscopic procedures or aneshthesia of patients in intensive structures where often anesthetic drugs are administered by doctors without an anesthesiology specialty [74,75]. There are still many light-years ahead of our ships to the vast universe of the brain. The first step, however, is made, and the derivatives of the EEG engrave even though little light through the foggy window of the brain to illuminate the way for the future of anesthesia monitoring. Evans JM, Davies WL. Monitoring anaesthesia. Clin Anesth 1984;2:243-62. Heck M, Kumle B, Boldt J, et al. Electroencephalogram bispectral index predicts hemodynamic and arousal reactions during induction of anesthesia in patients undergoing cardiac surgery. J Cardiothorac Vasc Anesth. 2000;14:693-7. Fabregas N, Gambus PL, Valero R, et al. Can bispectral index monitoring predict recovery of consciousness in patients with severe brain injury? Anesthesiology. 2004;101:43-51. Ghoniem M. Awareness during anesthesia. Butterworth-Heinemann Publishers 2001. Kearse Jr LA, Manberg P, Chamoun N, et al. Bispectral analysis of the electroencephalogram correlates with patient movement to skin incision during propofol/nitrous oxide anesthesia. Anesthesiology. 1994;8111:365-70. Kearse LA, Jr, Rosow C, Zaslavsky A, et al. Bispectral analysis of the electroencephalogram predicts conscious processing of information during propofol sedation and hypnosis. Anesthesiology. 1998;88: 25-34. Miller A, Sleigh JW, Barnard J, et al. Does bispectral analysis of the electroencephalogram add anything but complexity? Glass PS, Gan TJ, Howell S, et al. Drug interactions: Volatile anesthetics and opiates. J Clin Anesth. 1997;9:18. Rampil IJ. False negative BIS? Maybe, maybe not! Anesth Analg 2001;93:798-9. Puri GD. Paradoxical changes in bispectral index during nitrous oxide administration. Br J Anesth. 2001;86:141-42. Menigaux C, Guignard B, Adam F, et al. Esmolol prevents movement and attenuates the BIS response to orotracheal intubation. Br J Anaesth. 2002;89:857-62. Myles PS, Leslie K, McNeil J, et al. Bispectral index monitoring to prevent awareness during anaesthesia: The B-Aware randomised controlled trial. Lancet. 2004;363:1757-63. Katoh T, Suzuki A, Ikeda K, et al. Electroencephalographic derivatives as a tool for predicting the depth of sedation and anesthesia induced by sevoflurane. Anesthesiology. 1998;88:642-50. Monk TG, Saini V, Weldon BC, et al. Anesthetic management and one-year mortality after noncardiac surgery. Anesth Analg. 2005;100:4-10. Pierce ET, Drover D, Plourde G, et al. Patient state index (PSI): Optimization of delivery and recovery from propofol, alfentanil and nitrous oxide anesthesia. Anesthesiology. 2001:95:283. Billard V, Constant I. Analyse automatique de l'électroencéphalogramme: Quel intérêt en l'an 2000 dans le monitorage de la profondeur de l'anesthésie? Ann Fr Anesth Réanim. 2001;20:763-85. Kearse Jr LA, Manberg P, Debros F, et al. Bispectral analysis of the encephalogram during induction of anesthesia may predict hemodynamic responses to laryngoscopy and intubation. Electroenceph Clin Neurophysiol. 1994;90:194-200. Song D, Joshi GP, White PF. Titration of volatile anesthetics using bispectral index facilitates recovery after ambulatory anesthesia. Anesthesiology. 1997;87:842-8. Laussen PC, Murphy JA, Zurakowski D, et al. Bispectral index monitoring in children undergoing mild hypothermic сardiopulmonary bypass. Paediatr Anaesth. 2001;11:567-73. Renna M, Venturi R. Вispectral index and anaesthesia in the elderly. Minerva Anesthesiol. 2000;66:398-02. Rampil IJ. Bispectral EEG index during nitrous oxide administration. Anesthesiology. 1998; 89:671-77. Mathew JP, Weathersax KJ, East CJ, et al. Bispectral analysis during cardiopulmonary bypass: The effect of hypothermia on the hypnotic state. J Clin Anesth. 2001;13:301. Lambert P, Junke E, Fuchs-Buder T, et al. Inter-patient variability upon induction with sevoflurane estimated by the time to reach predefined end-points of depth of anaesthesia. Eur J Anaesthesiol. 2006;23:311-8. Grundy BL. Evoked potential monitoring. In monitoring in Anesthesia and Critical Care Medicine. Thomton C, Newton DEF. The auditory evoked response: a measure of depth of anaesthesia. Balliere’s Clin Anaesthesiol. 1989;5:559-85. Thomton C, Sharpe RM. Evoked responses in anaesthesia. Br J Anesth 1998;81:771-78. Iselin-Chaves IA, Maolem HF, Gan TG, et al. Changes in the auditory evoked potentials and the bispectral index: Following propofol or propofol and alfentanil. Anesthesiology. 2000;92:1300. Mantzaridis H, Kenny GN. Auditory evoked potential index: A quantitative measure of changes in auditory evoked potentials during general anaesthesia. Anaesthesia. 1997;52:1030-36. Newton DE, Thomton C, Konieczko KM, et al. Auditory evoked response and awareness: A study in volunteers at sub-MAC concentrations of isoflurane. Br J Anaesth. 1992;69:122-29. Doi M, Gajraj RJ, Mantzaridis H, et al. Relationship between calculated blood concentration of propofol and еlectrophysiological variables during emergence from anaesthesia: Comparison of bispectral index, spectral edge frequency, median frequency and auditory evoked potential index. Br J Anaesth. 1997;78:180-84. Gajraj RJ, Doi M, Mantzaridis H, et al. Analysis of the EEG bispectrum, auditory evoked potentials and EEG рower spectrum during repeated transitions from consciousness to unconsciousness. BJA. 1998;80:46-52. Jensen EW, Lindholm P, Henneberg SW, et al. Autoregressive modeling with exogenous input of middle-latency auditory-evoked pоtentials to measure rapid changes in depth of anesthesia. Methods Inf Med. 1996;35:256-60. Struys MMRF, Jensen EW, Smith W, et al. Performance of the ARX derived evoked potential index as an indicator of аnesthetic depth. Anesthesiology. 2002;96:803. Schmidt GN, Bischoff P, Standl T, et al. ARX-derived auditory evoked potential index and bispectral index during the induction оf anesthesia with propofol and remifentanil. Anesth Analg. 2003;97. Shannon CE. A mathematical theory of communication. Bell Syst Tech J. 1948;27:379-23 and 623-56. Viertiö-Oja H, Maja V, Särkelä M, et al. Description of the entropy algorithm as applied in the datex-ohmeda S/5 entropy module. Acta Anaesthesiologica Scandinavica. 2004;48(2):154-61. Klockars JG, Hiller A, Munte S, et al. Spectral entropy as a measure of hypnosis and hypnotic drug effect of total intravenous anesthesia in children during slow induction and maintenance. Anesthesiology. 2012;116:340-51. Bruhn J, Röpcke H, Hoeft A. Approximate entropy as an electroencephalographic measure of anesthetic drug effect during desflurane anesthesia. Anesthesiology. 2000;92:715-26. Richman JS, Moorman JR. Physiological time-series analysis using approximate entropy and sample entropy. Am J Physiol Heart Circ Physiol. 2000;278:2039-049. Chen W, Wang Z, Xie H, et al. Characterization of surface EMG signal based on fuzzy entropy. Neural Syst. 2007;15:266-72. Li X, Cui S, Voss LJ. Using permutation entropy to measure the electroencephalographic effects of sevoflurane. Anesthesiology. 2008;109:448. Särkelä MOK, Ermes MJ, Van Gils MJ, et al. Quantification of epileptiform electroencephalographic activity during sevoflurane mask induction. Anesthesiology. 2007; 107:928-38. Li X, Li D, Liang Z, et al. Analysis of depth of anesthesia with hilbert–huang spectral entropy. Clin Neurophysiol. 2008;119:2465-475. Rosso OA, Blanco S, Yordanova J, et al. Wavelet entropy: a new tool for analysis of short duration brain electrical signals. J Neurosci Methods. 2001;105:65-76. Huang NE, Shen Z, Long SR, et al. The empirical mode decomposition and the Hilbert spectrum for nonlinear and non-stationary time series analysis. Proc R Soc Math Phys Eng Sci. 1998;454: 903-95. Bruhn J, Röpcke H, Hoeft A. Approximate entropy as an electroencephalographic measure of anesthetic drug effect during desflurane anesthesia. Anesthesiology. 2003;92:715-26. Montirosso R, Riccardi B, Molteni E, et al. Infant's emotional variability associated to interactive stressful situation: A novel analysis approach with sample entropy and lempel–ziv complexity. Infant Behav Dev. 2010;33:346-56. Yoo CS, Jung DC, Ahn YM, et al. Automatic detection of seizure termination during electroconvulsive therapy using sample entropy of the electroencephalogram. Psychiatry Res. 2012;195:76-82. Chen W, Zhuang J, Yu W, et al. Measuring complexity using FuzzyEn, ApEn, and SampEn. Med Eng Phys. 2009;31:61-68. Bandt C, Pompe B. Permutation entropy: A natural complexity measure for time series. Phys Rev Lett. 2002;88:174102. Cao Y, Tung W, Gao J, et al. Detecting dynamical changes in time series using the permutation entropy. Phys Rev Ser 2004;70:46217-6217. Li X, Ouyang G, Richards DA. Predictability analysis of absence seizures with permutation entropy. Epilepsy Res. 2007;77:70. Li D, Li X, Liang Z, et al. Multiscale permutation entropy analysis of EEG recordings during sevoflurane anesthesia. J Neural Eng. 2010;7:046010. Olofsen E, Sleigh J, Dahan A. Permutation entropy of the electroencephalogram: A measure of anaesthetic drug effect. Br J Anaesth. 2008;101:810-21. Ferenets R, Lipping T, Anier A, et al. Comparison of entropy and complexity measures for the assessment of depth of sedation. Biomed Eng IEEE Trans. 2006;53:1067-077. Sleigh JW, Olofsen E, Dahan A, et al. “Entropies of the EEG: The effects of general anaesthesia,” in paper presented at the 5th international conference on memory, awareness and consciousness (New York, NY). 2001. Sleigh J, Voss L, Barnard J. What are electroencephalogram entropies really measuring? Int Cong Ser. 2005;1283:231-34. Bein B. Entropy. Best Pract Res Clin Anaesthesiol. 2006;20:101-09. Edmonds Jr HL, Triantafillou T, Tsueda I, et al. Comparison of frontalis and hypothenar EMG responses to vecuronium. Anesthesiology. 1985;63:324. Kern SE, Xie G, White JL, et al. A response surface analysis of propofol-remifentanil pharmacodynamic interaction in volunteers. Anesthesiology. 2004;100:1373-81. Shander A, Qin F, Bennett H, et al. Prediction of postoperative analgesic requirements by facial alectromyography during simultaneous BIS monitoring. Eur J Anaesthesiol. 2001;18:130. Lennon RL, Hosking MP, Daube JR, et al. Effect of partial neuromuscular blockade on intraoperative electromyography in patients undergoing resection of acoustic neuromas. Anesth Analg. 1992;75:729-33. Edmonds Jr HL, Couture LJ, Stolzy SL, et al. Quantitative surface electromyography in anesthesia and critical care. Anaesthesiology. 1985;63:324. Dutton RC, Smith WD, Bennett HL, et al. Craniofacial electromyogram activation response: Another indicator of anesthetic depth. J Clin Monit Comput. 1998;14:5-17. Yli-Hankala A, Vakkun A, Sandin R, et al. EEG entropy monitoring decreases propofol consumption and shortens early recovery times. Eur J Anaesthesiol. 2003;20:98. Davidson AJ, Huang GH, Rebmann CS, et al. Performance of entropy and bispectral index as measures of anaesthesia effect in children of different ages. Br J Anaesth. 2005;95:674-9. Walsh TS, Ramsay P, Lapinlampi TP, et al. An assessment of the validity of spectral entropy as a measure of sedation state in mechanically ventilatedcritically ill patients. Anesthesiology. 1997;87:1549-62. Haenggi M, Yppril-Wolters H, Buerki S, et al. Auditory event-related potentials, bispectral index, and entropy for the discrimination of different levels of sedation in intensive care unit patients. Anesth Analg 2009;109:807-16. Kaskinoro K, Maksimow A, Långsjö J, et al. Wide inter-individual variability of bispectral index and spectral entropy at loss of consciousness during increasing concentrations of dexmedetomidine, propofol, and sevoflurane. Br J Anaesth. 2011;107:573-80. Ropper AH. Cogito ergo sum by MRI. N Engl J Med. 2010; 362:648-9. Liu. Feasibility of closed-loop titration of propofol and remifentanil guided by the spectral M-Entropy monitor. Anesthesiology. 2012;116:286-95. Schraag S, Bothner U, Gajraj R, et al. The performance of electroencephalogram bispectral index and auditory evoked potential index to predict loss of consciousness during propofol infusion. Anesth Analg. 1999;89:1311-15. Schraag S, Bothner U, Gajraj R, et al. Patients anesthetized with halothane, but not with nitrous oxide and alfentanil. Anesthesiology. 1989;70:42-46. Stanski DR. Monitoring depth of anesthesia: In Miller RD, ed. Anesthesia, new york: Churchill Livingstone. 1990;1001-29. Vereecke HE, Struys MM, Mortier EP. A comparison of bispectral index and ARX-derived auditory evoked potential index in measuring the clinical interaction between ketamine and propofol anaesthesia. Anaesthesia. 2003;58:957-61.